Brilliant color, bold flavors, and an innovative mix of the traditional and modern are the hallmarks of Daisy Martinez’s cooking on her Food Network show, Viva Daisy! In this lavish collection of 150 recipes, the can’t-fail dishes Daisy learned to cook alongside her mother and grandmother in Puerto Rico mingle with the recipes she has picked up during her travels around the Spanish-speaking world, to create a classic cookbook that encompasses the very best of Latin cuisine. Daisy believes that the act of cooking and sharing food with your family is more than just a culinary experience, it’s an opportunity to create memories with your loved ones. Conveniently divided into Morning, Noon, and Night sections, Daisy: Morning, Noon and Night begins with sweet and savory breakfast treats, such as Peruvian tamales stuffed with raisins. A light noontime meal features Berengena con Coco (braised eggplant with coconut milk) from the Dominican Republic. And then there are the nighttime meals—everything from Arepitas de Yuca (yucca fritters) with pineapple-vinegar-chile dipping sauce to Tamarind Rum Glazed Chicken Wings. 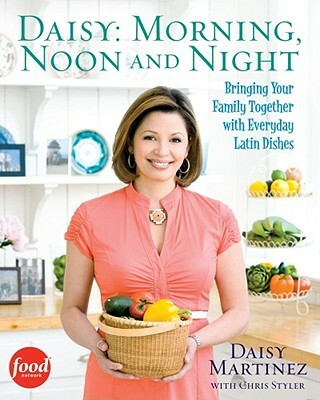 With her trademark warmth and candor, Daisy demystifies the staple ingredients of the Latin kitchen—which many people walk right by during their trips to the supermarket—and provides easy tips to help “Daisify” everyday dishes and turn each meal into an unforgettable memory.